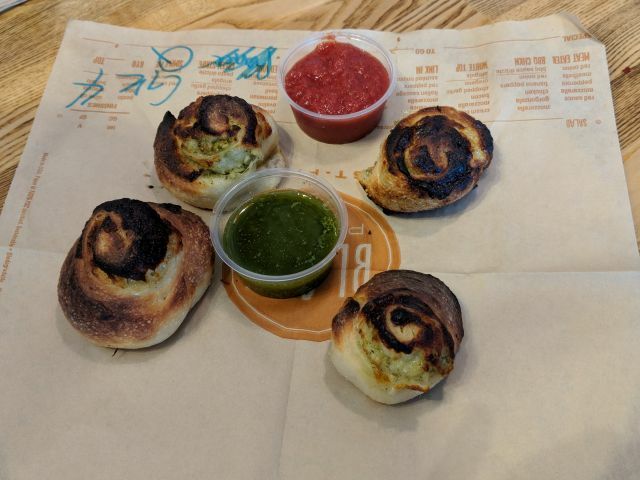 Blaze Pizza's Dough Knots feature pizza dough rolled up cinnamon roll-style with mozzarella and garlic pesto and then quickly baked. An order of four cost me $2.95 and came with red sauce and garlic pesto for dipping. I was told these are pre-made offsite and then baked at each location so you can't really customize them like the chain's pizzas (note: you should avoid these if you have a pine nut allergy as I was told the garlic pesto contains pine nuts). While these were nice in the way that fresh-baked bread is nice, they were lacking in the cheese and pesto department. They were charred a good deal but not so much to cause a burnt flavor (despite appearances). Coming across any mozzarella was a sporadic but happy meeting but these wasn't enough for a cheese pull or some oozing. The garlic pesto was just a hint here and there. Given the lack of flavor to the Dough Knots, the sauces were more a requirement than an option. 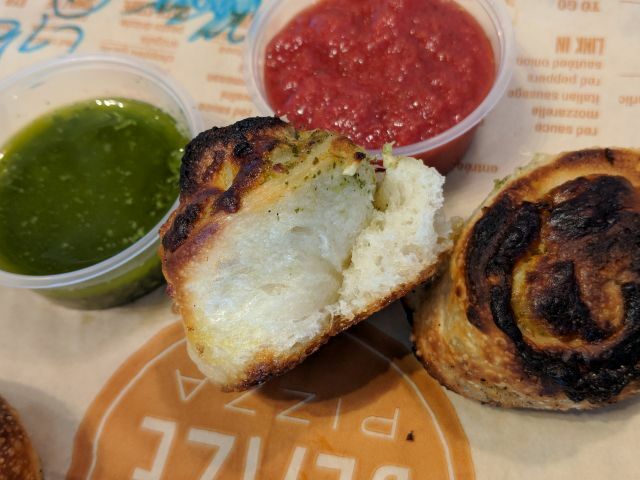 The red sauce added a rich tang, while the garlic pesto delivered that missing garlicky component. Overall, Blaze Pizza's Dough Knots were a little disappointing for me. Like their pizza dough, the bread portion had an enjoyable soft chew and crisp crust but it was just lacking in the taste department.